If there is one thing the Charlotte, North Carolina area is known for it is NASCAR Racing. Although the birth of NASCAR as a major sport may have began on the beaches of Daytona Florida, North Carolina and the Charlotte area is where many of the drivers and then race teams called home. 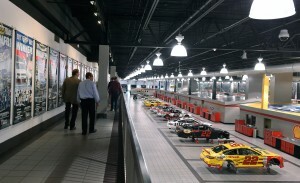 When NASCAR fans visit the Charlotte area they often look to visit many of the major race shops in the area, Charlotte Motor Speedway and of course the NASCAR Hall of Fame. We have made it easy for you with a road map below. Have fun and enjoy the NASCAR experience. To this day the majority of NASCAR race teams are based in the Lake Norman and Concord, North Carolina areas. Lake Norman just 20 minutes north of uptown Charlotte is home to teams such as Joe Gibbs Racing known as JGR in Huntersville which houses the Kyle Busch #18 car, Matt Kenseth #20 car, the Denny Hamlin #11 car and new this year for 2015 the Carl Edwards #19 car. 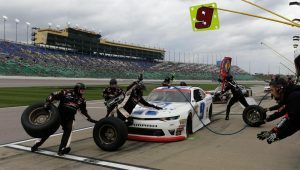 Based in Mooresville, JR Motorsports is the official race team and management company for Dale Earnhardt Jr. The team operates with four cars and on occasion, the iconic #88 car races as the fifth. JR Motorsports has won championships in 2014 and 2017, plus 37 series victories. A significant distinction that sets JR Motorsports apart is being the only NXS team to produce rookie champions, like Chase Elliot. 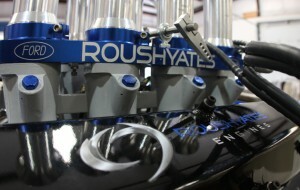 Continuing up I-77 to Mooresville you will find Roush – Yates Engines and several smaller teams located in the Lakeside Business Park. This business park is where several of the major teams including Penske, Robert Yates Racing, Roush Racing, Redbull Racing, Rusty Wallace Racing and many more use to call home. Since then many have disbanded, merged or gone to other locations. Also on the east side of Mooresville you can still find the original DEI (Dale Earnhardt Incorporated) which has a museum and gift shop open to the public. Check before visiting. 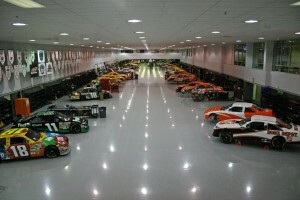 Penske Racing is located at 200 Penske Way, Mooresville NC 28115. Home of former NASCAR Champ Brad Keselowski in the #2 car and one of today’s hottest drivers Joey Lagano in the #22 car. Visit their race shop, displays and gift shop. Next up, home of the legendary Dale Earnhardt and the DEI stables. 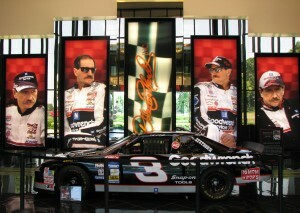 Dale Earnhardt Incorporated is also located in Mooresville along route 3 and offers plenty of displays as well as a gift shop. 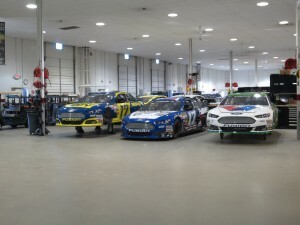 Once you have checked out Mooresville and what NASCAR history it has to offer head east toward Stewart Haas Racing in Kannapolis, NC and visit the 2014 Sprint Cup Champion #4 Kevin Harvick car, the #14 Former 3 time champion Tony Stewart car and the oh so popular #10 Danica Patrick car. Stewart Haas is open to the public and offers plenty for NASCAR fans to see and experience. Down I-85 a few miles near the Concord airport you find Roush Racing home of the #16 Greg Biffle ride, #6 Trevor Bayne and the #17 driven by Ricky Stenhouse Junior. 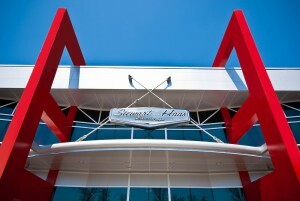 Stop by this great facility and enjoy the displays and memorabilia for the Roush / Fenway teams. Moving on down I-85 south a bit further to exit 49 take a left onto Bruton Smith Blvd and a right on Papa Joe Hendrick Blvd to Hendrick Motorsports home of the 5 time champ #48 Jimmy Johnson Car, 4 time champion #24 Jeff Gordon, #5 Kasey Kahne car and NASCAR’s most popular driver #88 Dale Earnhardt Junior. 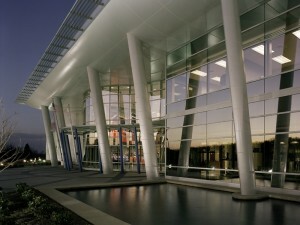 There is plenty to see at Hendrick Motorsports so be sure to check it out. 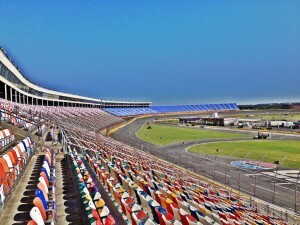 Just up Bruton Smith Blvd you will see the Charlotte Motor Speedway which includes the massive main track, Dirt Track and the world famous 4 wide Z-Max Dragway. Visitor often tour all the different track and then visit the gift shop and displays located at the grand entrance of the main track. If you are visiting for one of the races there are several areas to camp and tailgate as well. 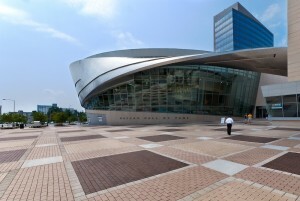 You have one last stop on your NASCAR tour and it’s at the NASCAR Hall of Fame in uptown Charlotte. Charlotte was awarded the NASCAR Hall of Fame a few years back and it is definitely worth checking out even if you are not a NASCAR fan. The Hall has something for the entire family including several interactive activities and collections pertaining to the sport. Thinking of a good time to visit? Most people pick the weeks of the AllStar Race and Coca-Cola for their trip to the Charlotte area and their NASCAR vacation. They visit the shops, see multiple races and check out the area. It is quite the site to see. One for the bucket list. Race fan or even not a race fan. Come see why NASCAR is the largest spectator sport in the United States per event. If you decide the Charlotte area is a great place to live visit www.LePageJohnson.com to find your perfect Charlotte area home.